I was looking for dish that was light and savory. 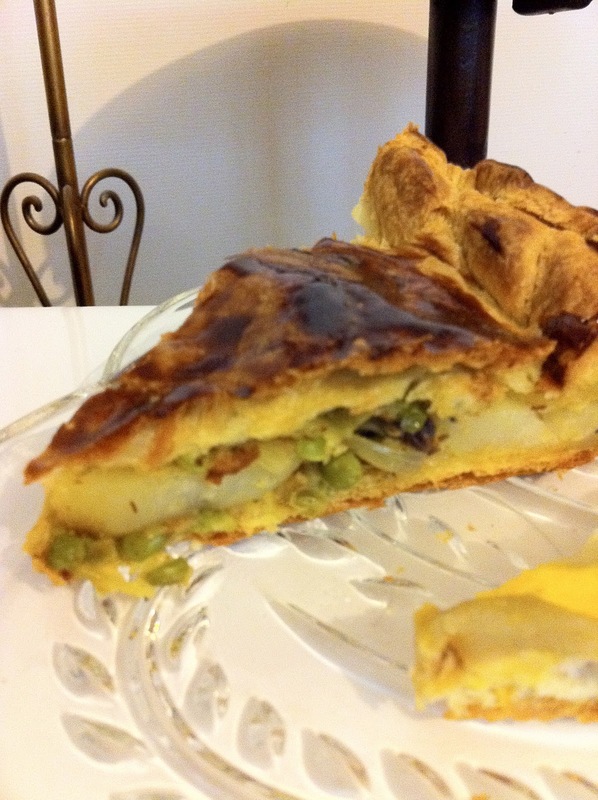 A tourte is a culinary delight that offers a unique presentation. A round flakey pastry stuffed with meat and goodies, it is as much of a delight to make as it is to savor alone or with guests. Always served with a bed of leafy lettuce drizzled with Mamie’s Dressing. As I’m writing this I’m thinking, gee, I can’t believe I haven’t shared that recipe yet! It’s a staple in every French home! Even kids know how to make it… So you’ll have to enjoy that with this recipe. Don’t forget to click the link to retrieve the ingredients before you head out to the store. As I was hiking the pilgrimage of Saint James in Portugal and Spain, I ate a lot of Spanish empanadas. One day in particular I accidentally forgot to take lunch break and was starving when I reached a medieval village and directly entered the first open restaurant on my path. I promptly used their restrooms and took a seat at the counter around the servers who were busily drying dishes. I ordered a bottled water and an empanada and was presented three overstuffed triangles neatly wrapped in filo dough. These little delectable packages became my favorite empanadas of all time. But the stuffings were far from the normal spanish recipe, launching my quest to recreate that lovely experience. Now that I’ve got the seasoning proportions correct, I was ready to try it on my friends. So I served a Tourte stuffed with everything I remembered from my vacation. Success. It’s perfectly savory, not salty, and the fish is such a light flavor almost like an afterthought, it’s easy to forget that it’s there. The curry is lightly spicy, but not overwhelming. The potatoes soaked in all the juices such that it was not soggy and in the end the curry potatoes really take center stage. And, soon I plan to serve this recipe as an hors d’oeuvre by wrapping the filling in filo dough at our next dinner party. But that will have to wait, because I don’t have any dinner parties planned anytime soon. I par-boiled my potato slices before starting the recipe. 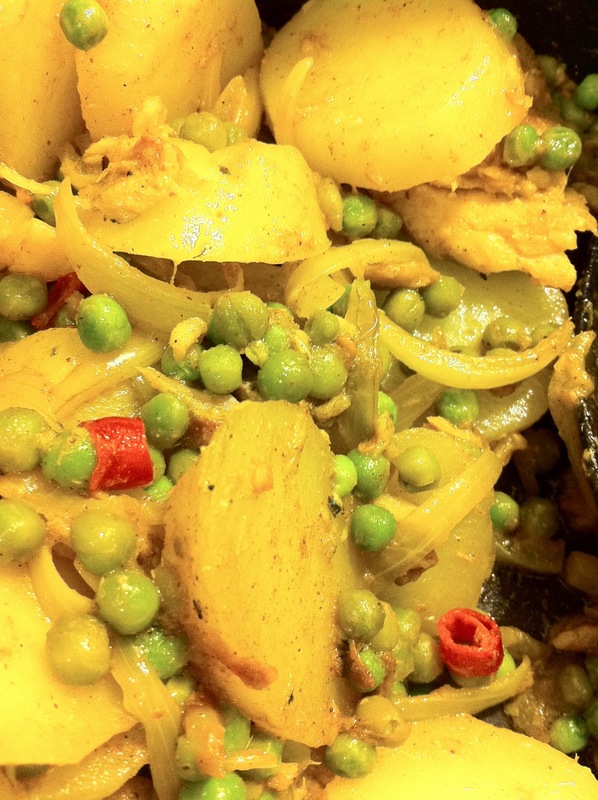 A short 5 minutes in boiling water should be sufficient to give 1 cm thick slices of potatoes a good head start. Then, in a large shallow saucepan simmer sliced potatoes, onions, crushed garlic and chilis in a bit of olive oil. Add the sardines, curry, lime juice, and sugar until heated through. 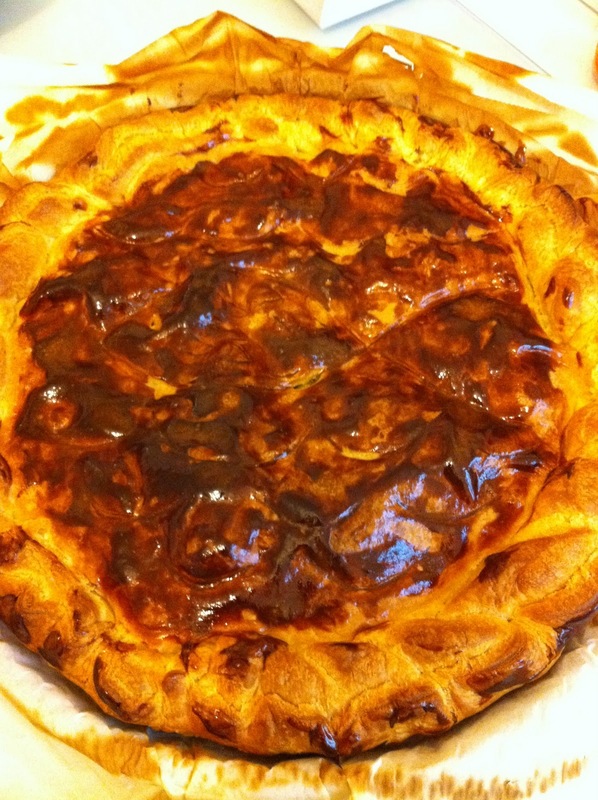 Spread this mixture across the prepared pastry dough, and lay the second puff pastry crust over top. 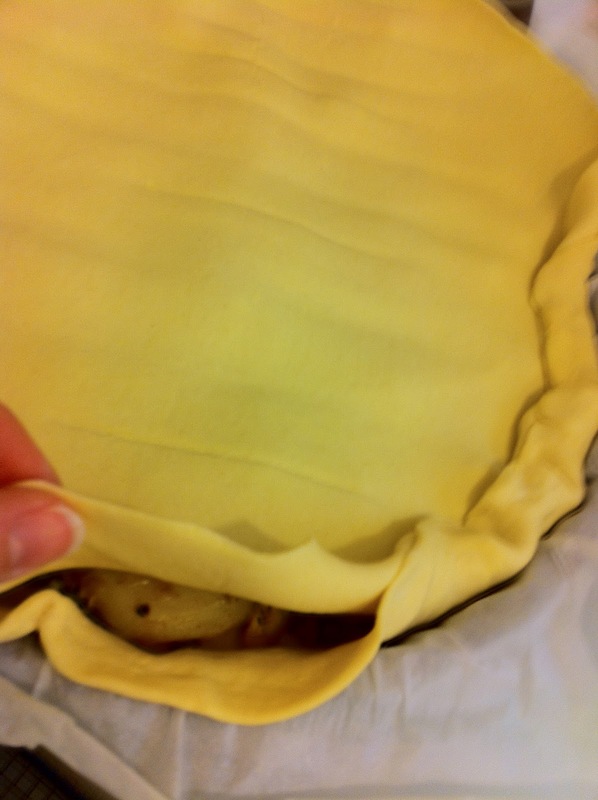 Fold down the edges and pinch them in regular intervals so they seal and draw designs in the top crust for decoration. Beat the egg yolk and brush on the top of the exposed puff pastry for a perfect golden appearance. Bake 50 minutes. It should get deep golden brown. If it starts getting too dark you can put a piece of aluminum foil over the top, but I didn’t need to for mine. Serve hot – on a bed of leafy lettuce drizzled with Mamie’s Dressing. Bon Appetit!